We visited a couple restaurants in Los Angeles on Sunday to celebrate my birthday. I rarely have particular plans of what I'd like to do to celebrate, but I know specifically where and what I'd like to eat. May will be a month full of events. There will be a number of birthdays, mothers day, wedding season for Hugh, a new niece coming any day now and all sorts of things in between. Cooking, amidst all the going out to eat and desserts these days bring, seems less intriguing but it's also the place I get recharged. I like being alone in the kitchen, no music, watching ingredients come together and trying something new. Some of that inspiration comes from visiting fun restaurants, so birthday months always leave me full of ideas. Both Gjelina and Tasting Kitchen are places we've visited before, but I love the ambiance at both. Most restaurant menus these days seem to give you a pretty extensive list of what is in each dish, boasting the name of the farm that it's produce is from or which variety of this, that or the other the food item is. I care about those details when I'm picking out food to cook at home, but while browsing the Tasting Kitchen's menu, so minimal and vague, I realized how that simplicity spoke a confidence in their dishes - that they didn't need to romanticize them to the guests. In typical LA fashion you can't change or substitute anything, so what is the point in knowing every ingredient anyway? So we got two appetizers: braised leeks + burrata and broccolini + lentils... so unassuming. Both great, but my favorite part were the lentils that had a caramelized sweetness to them and bits of crunchy breadcrumbs. 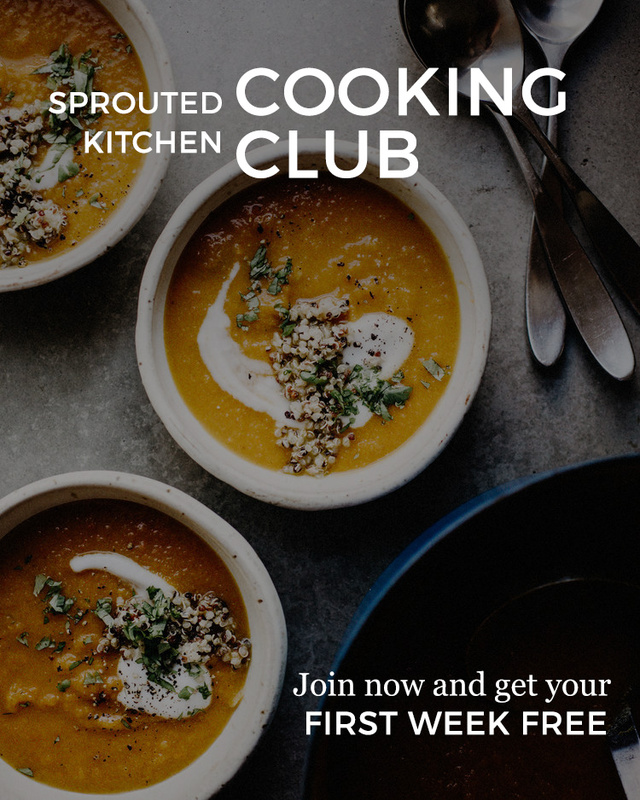 Sweet lentils! A new preparation to me, but Hugh would barely share with me so I was determined to recreate a portion I could savor all to myself. 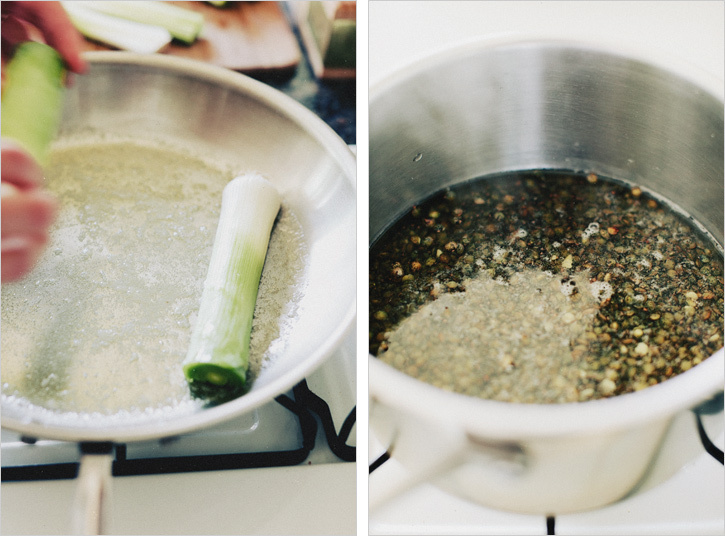 Leeks are naturally sweet, and the braising gives them a silkiness that melts along side the lentils. Such a simple preparation for such a glorious texture. Below is a recipe that mimicks a combination of those appetizers. It would make an excellent light lunch, a side dish for a number of proteins, or a tasty bed for poached or fried eggs. If you're skeptical of the sweetness, start with less muscovado and work up to a point you like it. A light brown sugar will work as well. If cooking these for more people, I would guess you could double or triple the amount of leeks and bake them in a 9x13 pan covered with foil. However, you will likely need less liquid than a direct multiplication. Eyeball it, you want the liquid just more than halfway up the side of the leeks. If you give this a try, let me know how it turns out. Trim the dark green parts from the top of the leeks, and just enough off the bottom to leave the ends it tact (this holds them together). Halve them lengthwise and remove any dirt. Heat the butter over medium heat in a large saute pan. Add the leeks, cut side down and cook about 3 minutes until browned. Drizzle the tsp. of olive oil on top, flip them over and cook another two minutes. Add the broth, agave and a generous sprinkle of salt and pepper. Turn the heat to a gentle simmer, partially cover and cook for about 25 minutes until they are buttery soft. While the leeks are cooking, start your lentils. Put the lentils, about 1 1/4 cups water and a pinch of salt in a pot and bring to a gentle boil. Cook until the lentils are cooked through, adding a bit more water if needed, and cook off any excess water in the end. If the leeks are done by this point, just take them off the heat and leave them covered, they're fine. Heat the butter and olive oil over medium heat in a frying pan. Add the lentils, sprinkle in the muscovado, rice vinegar, pinch of salt and pepper and saute to coat evenly. Taste and adjust seasonings as needed. 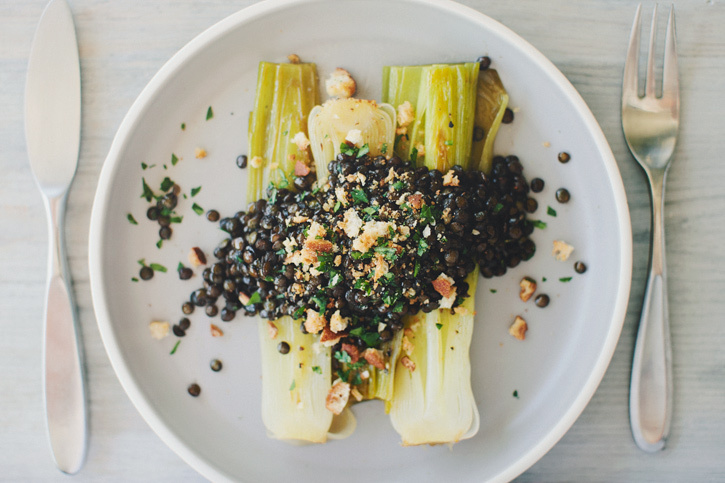 Plate the leeks with the lentils on top and garnish with breadcrumbs and parsley. Enjoy warm.